Over the last few days I spent some time in a favourite spot in the country. Prince Edward Island always has something to offer everyone. What I dig the most about it is the peace and quiet which is easy to find. For my up owning collection of shorts now called “Crooked Dice”, I found inspiration in an Art Gallery located in Montague. Talking with two artists and checking out the work that was going on made me think of how great it is for these talents and how that they are surrounded by such serenity. I’ll take an idea and often really run with it. I mean really run with it. I was wandering around when I came up with a short idea worth developing. Many writers have their places which deliver in inspiration every time. 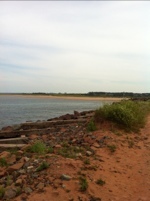 Prince Edward Island is one if those places that does it for me. I’m always interested in hearing from others if they have favourite places where the sights really drive their creativity. Let me know. I welcome your comments. Posted in Notes from the Frogpond.Tagged funny, humour, life, Montague, Prince Edward Island, Stories.